The account you about to read was in the form of an e-mail that Dale sent to his family in 2000. It is posted here as a celebration of Dale's Birthday, January 7th. All the pictures were taken by Karl Yost several weeks after the run and are used with his permission. You may click on any of the images to see a full size scan of them. My day started out with a trail run at Rocky Mountain Park with good buddy Karl Yost. 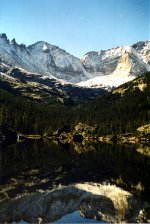 We arrived at Bear Lake parking lot around seven thirty this morning, the temperature was sixty degrees, strong gusty winds, with a clear blue cloudless sky. Very good weather conditions for running high country trails. 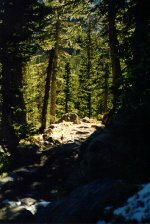 We started at Bear Lake trailhead (9450 feet), we ran from there to Black Lake (10800 feet). 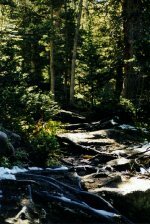 The trail was very challenging, with rocks and tree roots making the run very technical in nature. Without mishap and one hour and thirty minutes after leaving the Bear Lake trailhead we were at Black Lake. 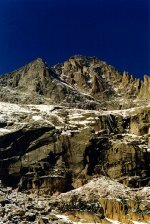 We walked to the top of the gorge on the East Side of the lake, just below the West Face of Longs Peak. The place was the most spectacular area I have seen in a very long time. Huge rock spires that rise from the gorge and the surrounding 14000-foot peaks were beautiful. 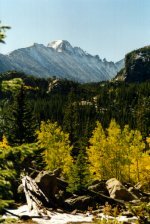 The four times that I have climbed to the summit of Longs Peak I have always looked down into this valley with awe. 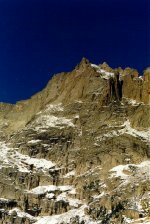 Standing at the valley and looking up was a real treat because the massive 14000-foot summit of Longs Peak made me feel like a small speck, as if I was only the size of an ant. 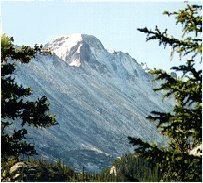 I felt so awe struck I had tears in my eyes as I looked up at the great mountain that towered over us. ..as if I was only the size of an ant. The run down was just as much of a challenge as the assent, the trail was hard to follow and without Karl keeping an eye on me I would have run off the trail more than I did. It was really funny at times, I would be running along and stop to find that trail was no were. Then Karl would come to my aid by letting out a load whistle, I would spot him and get back on the trail and run back of it again. This occurred three times on the descent until we got to the well-maintained trails at lower altitudes. All in all, it was a very rewarding day. If you would like to see all the pictures Carl took on his second run you can click here.